Have you always wanted to try scuba diving, but never had the time to get certified? This is your chance! Our experienced instructor will spend about an hour with you in a pool, teaching you how to use your scuba diving equipment, and getting you comfortable with the idea of breathing underwater. After you've done this short 1-hour instruction, you're qualified to go scuba diving with a divemaster up to 30 feet for the rest of your vacation. 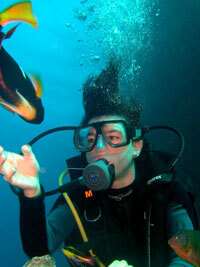 To add a 1-tank or 2-tank scuba dive to your resort course, visit our Scuba Diving page. After your scuba diving trip, you can relax and enjoy yourself at the brand new Posada Freeman hotel, with it's full service bar and restaurant, and enjoy full use of the beach and beach facilities absolutely free. It's our way of saying thank you for choosing us for your water sports here in Mazatlan. Spend approximately 1 hour in an enclosed swimming pool environment with an instructor, learning the basic skills of scuba diving. With your reservation of a scuba dive, you are then ready to experience scuba diving in Mazatlan! Board our unique Amphibious Boat or our panga-style dive boat and head for the waters of Deer Island. After a short boat ride, you'll be engulfed by the underwater world of Mazatlan, at one of our best dive sites. Possible sightings include lots of tropical fish, big game fish like sailfish, manta rays, as well as remains of sunken ships! After your dive, relax on the beach at the brand new Posada Freeman Hotel, enjoying drinks at the bar, or swimming in the pool. Cruise Passengers: Yes! This tour makes a great shore excursion. Pick the best schedule for you! Requires: Reservation of a 1-tank or 2-tank scuba dive if you actually want to go scuba diving. To book your dive(s), click here. No experience required. Approximately 1 Hour of Instruction in the basics of scuba diving in a swimming pool environment. Kids: Ages 14 and up. Kids are the same price as adults. Don't forget to book your scuba diving afterward! What a great deal! Not only do you get to dive, but then afterward you can relax and lounge at the hotel and beach club, enjoying the restaurant, bar, pool, and beach facilities to your heart's content.